The ‘Refined Toughness’ concept of blending the strong presence of an SUV with high quality resonated with Takanori Tsubaki, who oversaw the exterior design. Achieving it, however, would demand that he gain a deeper understanding of the essence of KODO Design’s current iteration and push it to a new level. An approach aimed solely at using dynamic lines and surfaces to express strength and vitality would fail to strike the right chord with customers as an expression of finely honed beauty. The initial design sketches showed no deviation from the intended direction. But when converting the ideas that looked as though they would work into 3D data, something did not seem quite right. This led the team to repeatedly revise the 2D data before creating models for inspection. Once they had come up with proportions that everybody liked and it appeared as though the design was coming together, the team paused to take stock before proceeding to the next step. “We weren’t completely satisfied. We had come up with a good design, but we wondered if it was the design to go with or if we could do more,” Tsubaki said. The schedule didn’t leave much more time for the design process. Even so, the team decided to put the work done so far aside, ignore the restrictions they faced and try again to come up with a sketch of the ideal they were shooting for. The team was close but couldn’t give up without pushing a little further to explore the possibilities. They made a clean start and looked beyond the CX-5 team to a variety of staff members in charge of concept cars and other design projects as well as asking eager young rookies to examine the design and create sketches as part of a wide-scale collaborative effort. As a result, a suggestion from Mazda’s Advanced Design Studio was adopted for the surfaces of the body side panels, and an idea drawn up by a young designer was used for the rear end. Bringing together the wide variety of perspectives, diverse sensibilities and experiences of all who contributed led to a breakthrough and the final sketch – the design the team had been aiming for – was completed. Things were no simpler in the following stages. Being a two-dimensional rendering, the design sketch wasn’t limited by strict adherence to dimensions. Several clay modelers added their own interpretations and lent their individual sensibilities to three-dimensional models. So, each modeler creates a model with different nuances. The differences may be only a few millimeters here and there, but those subtle variations sometimes heighten the form originally intended by the designer or create beauty that did not exist in the original design. A number of “top gun” modelers known for their skill and experience came on board from among the 30 or so clay modelers working in the company. From the single design sketch they created five ¼-scale models that differed slightly from one another in their nuances. After a thorough review, the best elements of two models were maximized to create one final model. This is how the final full-scale model was created. With the ideal form, which is not limited by actual dimensions, before them the truly difficult part of the process began. In preparing for mass production, this is when the collaborative work begins between the designers, modelers and the layout engineers responsible for the numeric values. Faithfully reproducing the model in the final product begins with making adjustments in increments of approximately 20mm while repeatedly exchanging data on the surface measurements. As the fine tuning continues, it moves to increasingly finer increments of 10mm, 5mm, 3mm and 1mm and is not complete until the measurements can no longer be changed. 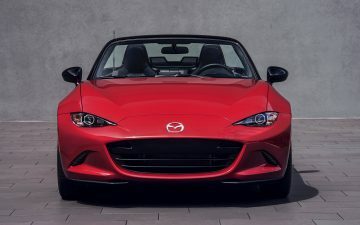 The usual tolerance for differences between the completed clay model and the mass production vehicle is between 1 and 5mm, whereas at Mazda it is between 0.1 and 0.3mm. The sculpting skills and precision that make these tolerances possible enable Mazda design layout engineers to retain the appeal of the final full-scale model and deliver it to Mazda’s customers with the final product. Turning to details, the front grille’s sense of depth is achieved using an array of small parts shaped like three-sided pyramids, and the entire grille curves gently inward toward the center. The brand symbol in the center of the grille appears to be floating against the background of the deep, dark surface of the air intake. This expression could not be achieved in its ideal form simply by lining up the parts. The angle of each part was adjusted numerous times and then lined up at different angles to match the inward curvature of the grille. Efforts extended to the shapes of the parts as well. They were repeatedly rendered as data, prototypes were made and different paints were tested to achieve the most attractive finish. This attention to the minutest details, even in hard-to-see places, demonstrates Mazda’s commitment to achieving the ideal form. It is an uncompromising commitment to perfection fueled by Japanese sensibilities.